Brazil shows its military might in the Tripece Border with Paraguay and Argentina in a message to the world that is present in the region and alert. 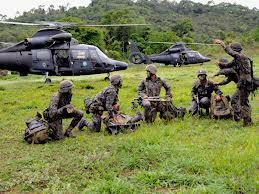 “It’s a border operation aimed, above all, the prosecution of crime,” said Brazilian Defense Minister Celso Amorim. However, some experts believe that with these massive military exercises while Brazil sends a message to the world of greatest of its vast border with 10 countries, as a guarantor of regional stability, with no other avenue and, arriving estreajeras military, Operation is sopreza done so, logo U.S. senators were in Ciudad del Este and Arab community accused of having terrorist cells that was rejected by the Brazilian Minister Celso Amorin, who concidera levianas the accusations and has no credibility. Agatha began military operations earlier this year have helped the Brazilian authorities to seize drugs and other smuggled goods to the country and destroy clandestine landing of aircraft. While Brazil has grown in recent years to become the sixth largest economy, also increased its diplomatic presence in the world and its military power. The South American giant has sought to develop its defense industry and its deterrence capacity, for example with the French Scorpene submarine purchase and transport helicopters. Aware that all this is viewed closely by its neighbors, Brazil seeks to prevent Agate operations in the region are perceived as threatening or arrogant policy. Without referring specifically to the operations Agate, Amorim himself suggested this week the need to improve communication between the Ministry of Defense and the Brazilian diplomacy. “We can go further in creating formal channels of communication and fluid,” said Amorim, who led the Brazilian Foreign Ministry during the Lula government. Esta entrada fue publicada en rictvnoticiastv Digital tv y etiquetada Agate, argentina, bolivia, Brazil, brazilian authorities, Celso Amorim, combat helicopters, drug trafficking, Fernando Lugo, paraguay, patrol boats, Uruguay. Guarda el enlace permanente.